Police choppers circle the 20th floor of the Chicago Internal Affairs Division's downtown headquarters. SWAT. marksmen stand ready on nearby rooftops, their high-powered weapons targeted on Danny Roman (SAMUEL L. JACKSON), who is holding the chief of the I.A.D. and his staff at gunpoint. Roman's desperate gambit has been triggered by an equally desperate situation: his world has been destroyed by false charges of murder and embezzlement brought against him. Roman knows that people listen when lives are at stake; he knows that he has a chance to prove his innocence if he can just buy a little time -- time that he urgently needs to find out who's behind the frame-up. He understands all of this implicitly -- because Danny Roman is a Chicago Police officer - and the best hostage negotiator in the department. But right now, Roman is a hostage-taker - and he needs someone who will listen to him. So he asks that Chris Sabian (KEVIN SPACEY), a respected negotiator from another precinct, be brought in to mediate. Sabian squares off with his formidable opponent, a man he knows only by reputation, as he attempts to understand and defuse the explosive situation. Although he begins his task convinced that Roman has had a complete breakdown, Sabian starts to wonder whether this hostage-taker is a man gone mad or, instead, what Roman claims to be - an honest cop who must break the law to find justice for himself. Ultimately, Sabian is driven to answer the same questions that are obsessing Danny Roman. Who's behind the frame-up? And where does Roman fit into the scheme? 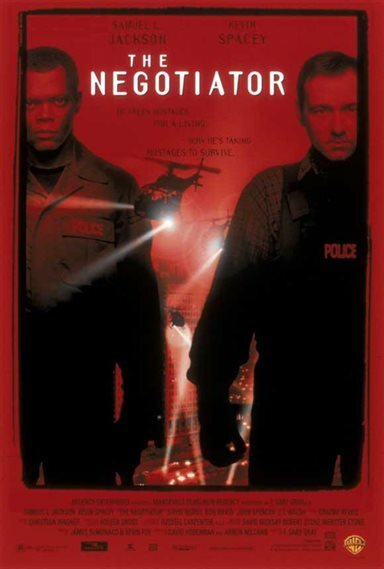 Academy Award-nominee Samuel L. Jackson and Academy Award-winner Kevin Spacey star in a taut drama about a battle of wits and wills that has human lives hanging in the balance. Download The Negotiator in Digital HD from the iTunes store. The Negotiator images are © Warner Bros.. All Rights Reserved.